Colorful graphics, contrast stitching and Columbia's Omni-Shade™ UPF 30 sun protection make the Backpaddle a summertime favorite. Quick-drying and super comfortable, it's perfect for long days at the lake, rumbling around in the backyard or fun trips to the local park. Colorful graphics, contrast stitching and Columbia &apos;s Omni-Shade™ UPF 30 sun protection make the Backpaddle a summertime favorite. Quick-drying and super comfortable, it&apos;s perfect for long days at the lake, rumbling around in the backyard or fun trips to the local park. 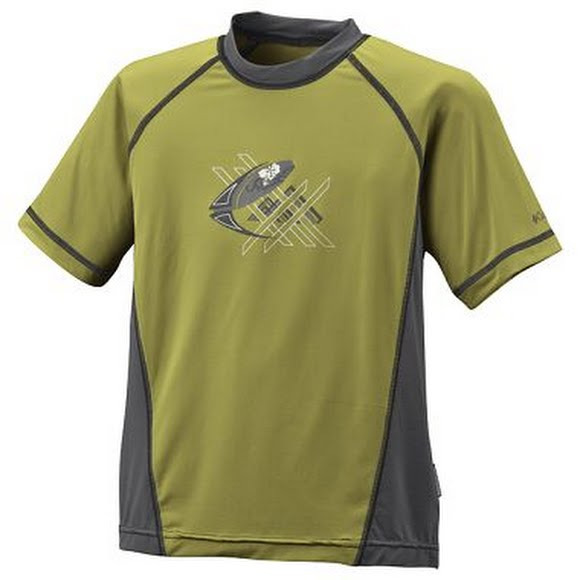 Built in sun protection offers an extra barrier to repel harmful UV rays and elastane stretch means this shirt can cover his every move including that technical scamper across the riverside rocks to check out big brother&apos;s crawdad catch. A hit of contrast color on the side panel adds style points to this high performing wardrobe staple.